Indian education system, one of its kind in the world, is in dire need of reinvention in order to keep pace with the world and to equip the Indian students with enough skills to compete at the global level. 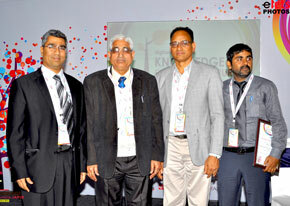 Some of the best minds in the country came under one roof at the digitalLEARNING Knowledge Exchange in Jaipur to deliberate over how to teach NextGen. here is a need to understand and reflect upon what is needed to build a world-class education system. A serious concern for the higher education policy makers and the educationists is the need to maintain high academic standards. Today, technology and globalization have increased the accessibility to higher education, and some of the best educationists and technocrats across the country came together at the Knowledge Exchange platform provided by Elets Technomedia in Jaipur to discuss how teaching with technology is not only about staying updated on the latest tools, but also about knowing how to successfully incorporate the best tools into your teaching when and where it makes sense, and take education to the next level. For this purpose, they held sessions over a variety of topics changing the educational landscape of our country. Technology enhanced learning – What can we learn from MOOCs? Agreeing with Dr Shetty, Prof Iftikhar Alam, Dean, International Institute for Special Education (IISE), Lucknow also echoed that we have to keep faith in the aptitude of students. “Technology is indispensable but we cannot be slave to it. MOOCS is here to stay. It is something which we have to use judiciously. Today, the millions can be hooked to same programme worldwide, not just one country. But even with MOOCs we have to go that extra mile to make it interesting. Then it can do wonders for our country. Maybe then reverse brain drain will happen in the interest of India if we make good use of it”, he said. 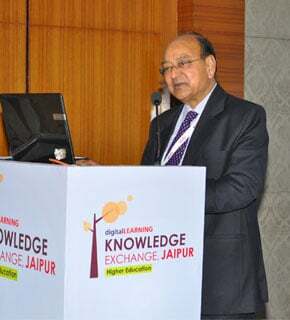 Dr RN Sharma, Vice Chancellor, IASE University, Churu said that technology should not be merely imparting info, but the aim should be to churn, so that the students can make good use of knowledge and learning gained from it for greater social betterment. Prof KC Singhal, Vice Chancellor, NIMS University, Jaipur said that “the traders and the politicians only spoil the education system. The purpose with which the British had painstakingly put up an education system is far from served. We, therefore, are still producing only supervisors, not innovators and thinkers. That system must change, if the country has to progress. We need to start dissemination of knowledge and building of the society from the day 1. DD Shukla (Alpha College of Engineering, Ahmedabad), further added that “Before we start with this dream, we need lots of work before beginning to produce results. We need more relaxation for the foreign investments. Only then will we progress. More than anything else, we need to produce entrepreneurs. Today’s world is a global village. Stressing on this point, Rajan Mahan, Chairman – Board of Studies, Haridev Joshi University of Journalism & Mass, Communication said that “Besides the real world, a cyber world has come up. This global village is both a challenge as well as an opportunity. The human lives have fundamentally changed in every sphere. This comes for higher education at a time when we are facing a transformational change in the sphere. One way is collaboration to face challenge, where the resources and knowledge are shared. Dr K Veera Venkataiah, Principal and Director (International Relations, Chaitanya Postgraduate College, Varangal) said that research should be beneficial to the society. Dr DD Shukla, (Principal, Alpha College of Engineering, Ahmedabad) said that no verification is needed if the research is genuine. All one needs to do is pay money to get it published. This brings the credibility of research done in India under question vis-à-vis the foreign universities and the students. Sraban Mukherjee threw light on the fact that today, even school children need smartphones. Today, Facebook and other social networking sites keep the students occupied and focused. The students are all unique with their different learning abilities. These different learning needs can be taken care of by technology. The traditional classrooms could not do that. Dr Ashok Kumar Jetawat, Director, Aravali Institute of Technical Studies, Udaipur held that what is missing in education is motivation and raised the question as to why digital content is not available in the local languages. He shared the results of experiments, where the use of technology is much preferred and makes a successful study for the students. Naresh Duble, DGM, Training and FMD, Armstrong explained the importance of acoustics in education. “We will develop on how acoustics really impact and can enhance higher education in the country. In India, this is a new initiative we have started. It is not enough to understand what is taught in a class. We need to absorb, assimilate and reproduce that. The teachers and the students have to connect. It can only happen if you have the correct acoustical environment and architecture. The background noise and reverberation time are the two main aspects as far as acoustics goes. We have a nice instrument which can distinguish sound once it comes back to it after .5 secs. It can help the backbenchers and people with hearing impairment. The results dramatically improve. Acoustical comfort is a new term being added, which comprises intelligence of the sound, privacy, low distraction and concentration. Global standard for background noise is 40 decibel. We need to see where we stand globally as far as reverberation and background noise are concerned. This view was reverberated by all. Especially when today, we are not talking of classrooms of just 50-60 students, but 100-400. Singapore uses thousand seated auditoriums for the same. We need to make noise about sound. Knowledge transmission otherwise will not happen. The speakers agreed that use of technology is often the biggest fear of teachers. They should be trained in it and technology should be used to accurately evaluate the students. 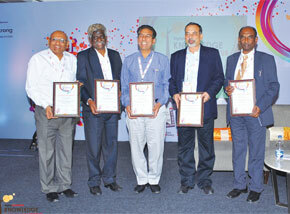 Can incubation centres assist to boost employability? Today, there is a growing importance of incubation centres in the country. HRD Minister Smriti Irani has been stressing on it and urging educational institutes to take them as a stimulus for nation building. Recently, the incubation centres have become a very important part of education in the country. Prof Dr Virendra Kumar Sharma, Vice Chancellor, Bhagwant University, Ajmer said that employment generation is an important part of employment generation. While incubation centres may not be able to assist in boosting employability, they can certainly boost employment generation. All of us. “In country of billion plus population, we should have billions of entrepreneurs. I remember the time when the textile industry was nationalized and no one questioned that if a person can’t run the enterprise, can the government do it. Every student in educational institutes should be motivated for entrepreneurship. There is a great promise in running incubation centres in campuses. Many personality traits required in becoming an entrepreneur. As far as entrepreneurial spirit goes, there has to be constant motivation to start something new after 7 years. An entrepreneur cannot stop or else stagnation will settle. In every state, incubation would be done by 1 or 2 persons only. This can’t be compared to fully grown mature company that we are talking about. The experiments show that use of technology has resulted in better performance of the students. V Venkaataih said that today the countries are of two kinds. Some use more technology and others use less technology. The Vice Chancellors have to check plagiarism in thesis, research etc and promote genuine work.